When it comes to professional life, gender roles do have their benefits as well as drawbacks. You need to know this fact before you choose any profession. You need to understand how people perceive a certain profession before you decide to take it up. Advantages and disadvantages of gender roles had mentioned below. Gender roles have several benefits that help us get hired and promoted in certain professions. There was a time when women were assumed to be homemakers while men were the breadwinners. While that old school of thought is slowly eroding, certain professions do prefer certain genders. 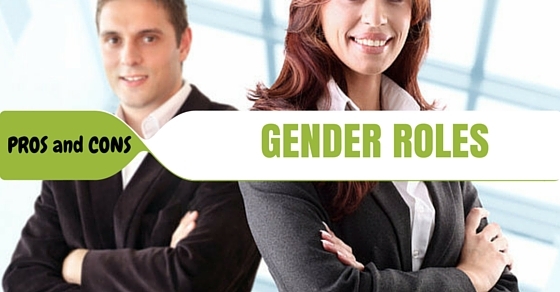 Here we have listed out some of the prominent benefits of gender roles in one’s career. It is difficult to take it as a positive factor that certain genders get special concessions in certain professions. For instance, women get special concessions due to their weaker health as well as household responsibilities. Similarly, as a result of the cultural impact, women are not made to stay late and work in many countries. These aspects simplify the work life for women in many countries. Men maybe regarded efficient and capable even in their later ages like in their 40’s. On the contrary, companies may think twice before hiring a woman beyond a certain age. This means that men have greater job security after a certain age. A code of conduct has been defined by society and professional organisations for each gender. If they fail to abide by this unwritten code of conduct, they may even fall in trouble. Even the jobs of best male employees can fall in danger if they speak indecently or indiscreetly to their female counterparts in office. Women need to be extra careful with their dress codes. Revealing or short dresses can hamper their reputation. Their character may even be questioned if they do not adhere to a proper dress code. This is one problem that men do not face. Every positive thing has a negative side to it. There are several cons of gender roles that prevent aspiring candidates from reaching their goals. These are aspects that act as barriers and prevent the candidates from ascending the success ladder. Here we have listed out some of the major drawbacks of gender roles. Contemplate on these and decide your career wisely. People often associate your liking for a particular job with your being masculine or feminine. This is a very bad way to treat people who have special liking towards certain professions. Till the last century, women could never dream of becoming engineers as these were male dominated fields. Similarly, women were not appointed as police or military officers as they were regarded as weak and lacking strength. A man could never dream of becoming a homemaker or a fashion designer. These were regarded as feminine professions and men in these fields were simply mocked at. They were teased to lack the drive of manly aspect. Many people in the past even refrained from taking up such professions because they feared the teasing and mockery. It is easy to combat emotional barricades but it can be really difficult to change someone else’s attitude towards you. It is possible to fight your family and take up what you wish to do but you cannot get rid of bias and partiality from your bosses, seniors or peers. You may Lose a chance you deserve and someone from the opposite gender may get the job or designation even though you are far better in the field. The reason is simple. Your seniors think that this is a job not fit for your gender. Such instances can be annoying and demotivating. Going against the crowd requires real courage. Few people possess that kind of courage. If you do not have the patience to endure such mockery, you may give up half way through or even fret to take up a different career. When you fight against your near and dear ones to take up a career, you need to make sure you succeed. Often, even when you possess the capabilities and skills, you may never make it to your goal because of the cultural barriers. Inspite of growing awareness among people, there still exists gender role discrimination. This affects and influences career choices of men and women around the world. This is also the reason why many times you encounter the wrong people in the wrong career. It is high time we take the right steps to ensure these are erased permanently. Here we have listed down a few steps you can take to eliminate gender role discrimination and promote gender equality. Start today and create awareness among your near and dear ones regarding gender role discrimination. Try to make people you know, understand that attaching qualities to a certain gender is ok but generalizing is not ok. It is snatching away significant opportunities from deserving candidates. While you cannot bring about a reform or a revolution, you can still start explaining a neutral approach to your family. Once these ideals pass on to people of the next generation, the discrimination will automatically reduce. Debates are ideal occasions where you can place your part of the argument effectively. Try to reveal to the people the drawbacks of gender role discrimination. Reveal with examples how many people with skills have never received recognition simply because of the gender role discrimination. While your competitors may argue that gender roles statistics help to identify the right skills easily, tell them how sometimes it also leads to wrong interpretations. Make them think and understand themselves how gender role discrimination can affect adversely. Try to organize group discussions where you can discuss such significant topics. Though there are few pros and cons of group discussions, you can explain your views and welcome opposition with relevant explanation and examples. It is not possible to change the thought process of people without giving them an opportunity to voice their own opinions. Group discussions help people opine and present their views. In the light of facts and the right reasoning, there are greater chances of people understanding your viewpoint. Skits and plays have been the common tools used by great leaders in the past to influence the masses. Try to organize skits and plays that highlight the drawbacks of gender role discrimination. Make sure the skit script is humorous and entertaining. You also need to avoid any harsh wordings that may hurt the sentiments of your audience. Organize these plays in schools and colleges. Young people are always willing to accept new ideas. The thought process of young people defines the future of the nation.These are reasons why it is best to organize these plays in educational institutions. Today, even people who are introverts outside tend to be very active on social media. That is the reason why advertisers use social media to market their products and services. It is more effective than the word of mouth publicity of the past era. This is another reason why you can use social media to start a movement against gender role. You may have an opinion poll where you can ask what people think facts about gender roles. You may also start a movement by telling people to act against gender role. Even blogs on gender role discrimination can act effectively if you use them wisely. Most people find it very easy to preach gender equality to people outside their homes but change their attitude when it comes to their own family. This dual nature is definitely not acceptable. Understand that times have changed an there no benefits of gender inequality in this modern era. You need to believe what you preach. You must share the household responsibilities with your better half. When you share financial burden and household responsibilities, life gets much simpler. If you follow these steps, at least the next generation will follow equality. Start today and you can see the change in a couple of decades.